Grid connected photovoltaic (PV) systems feed electricity directly to the electrical network operating parallel to the conventional source. This paper deals with design and simulation of a three phase inverter in MATLAB SIMULINK environment which can be a part of photovoltaic grid connected systems. The converter used is a Voltage source inverter (VSI) which is controlled using synchronous d-q reference frame to inject a controlled current into the grid. Phase lock loop (PLL) is used to lock grid frequency and phase. 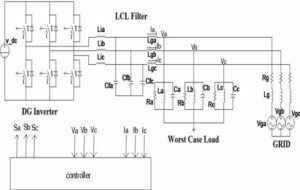 The design of low pass filter used at the inverter output to remove the high frequency ripple is also discussed and the obtained simulation results are presented. The design of the system is carried out for feeding 1KW power to the grid The Inverter is controlled in order to feed active power to the grid, using synchronous d-q transformation. 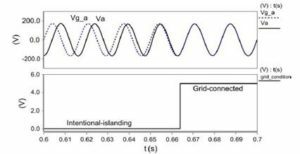 PLL is used to lock grid frequency and phase. The phase detection part of PLL is properly done by using dq transformation in the three phase system. The FFT analysis of the inverter output current shows that the THD is within limits and the controlled injected current generates three phase balance current which controls power at the output of the transformer. To simulate the actual grid connected PV system, the PV model, dc to dc converter model and the control of the dc to dc converter should be included in place of the battery source. Samul Araujo& Fernando Luiz, ― LCL fiter design for grid connected NPC inverters in offshore wind turbins,‖ 7th International conference on Power Electronics, pp. 1133-1138, October 2007.